We can help keep those costs down. Almost all companies now use IT to record sales. Some organizations such as low-volume, high-value manufacturers, may still be able to take and fulfill orders manually. However, most retailers and high-volume manufacturers can no longer complete the sales process when their systems are offline and unavailable. This is especially true for online only merchants whose entire order processing capabilities come to a grinding halt when their systems are offline. A company's average sales per hour, adjusted to account for the percentage of sales that can and likely will be completed manually during a system outage, can be used to estimate the revenue that will be lost per hour of downtime. However, this yields only a very rough approximation. Not all of the sales that would have otherwise occurred during a downtime event will be permanently lost. Some persistent customers will wait for their preferred vendor's systems to come back online rather than switching to a competitor. If an outage creates a disruption in a supply chain with a high level of expectation in responsiveness (i.e., medical services or overnight delivery), the business may be exposed to damages. Often, damages stem from the inability to deliver (i.e., loss in delivery fees due to arriving late or lawsuits due to collateral damages). These highly publicized situations can impact shareholder value. On the other hand, the value lost when loyal (or potentially loyal) customers do switch to a competitor is more than just the value of the purchases that would have been made at that time. It amounts to the lifetime purchases those customers might have made. Another significant downtime cost is lost employee productivity, which can be measured in terms of the salaries, wages and benefits of idled people. If, for example, the work of 1,000 people earning an average of $60 per hour, including benefits, depends on a system that becomes unavailable for one hour, the value of the lost productivity can be estimated as $60,000 for that hour. The estimate might be somewhat lower if some employees are still able to do a portion of their work manually or switch to tasks that require only systems that are still available. Nonetheless, many organizations have become so dependent on IT that an unavailable system totally idles a significant portion of the enterprise, when the old manual processes often no longer exist. For example, what happens when there is an email outage? What happens to that new cost-saving voice-over Internet protocol (VoIP) phone systems when the LAN or Internet goes down? 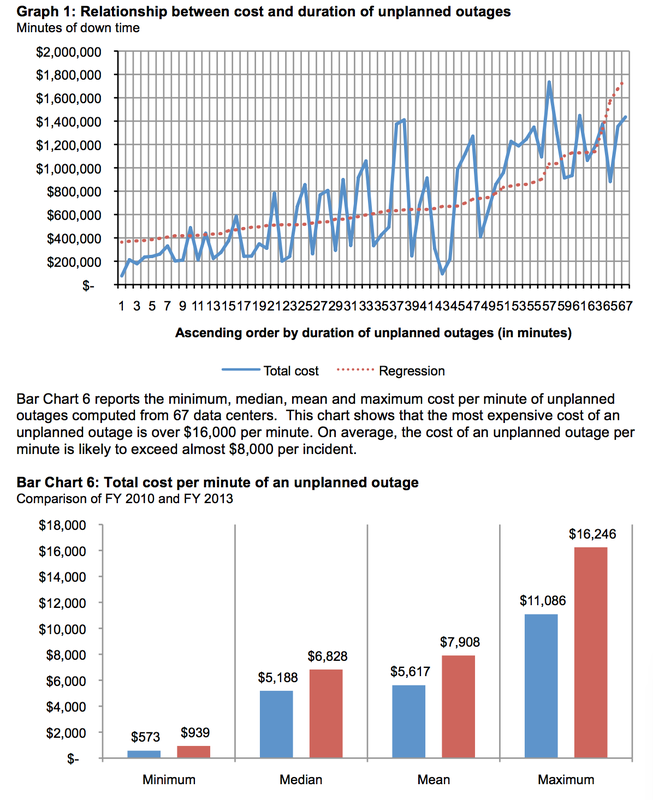 There have been many studies but a recent study on Costs of Data Center Outages was performed and referenced here. As shown by the charts above the cost of an outage is significant and for every minute that passes the costs increase significantly. If the outage can be minimized by reducing the time it takes to send out notifications and quickly and effectively communicate status to your customers or employee, there can be substantial financial savings. Notify your customers before they notify you. Be proactive! Always provide a status updates when you've commited to do so. Personalized messages with accurate information instill confidence the situation is under control. Even for small teams it is important for the first engineer addressing the situation to be able to send out the first notification immediately. However you compute the costs it is surprising how little prepared most companies are. While using Constant Status a single minute of savings in an outage can pay for a 2 year subscription, but the savings of being able to retain your customers is priceless. Be smart and keep your customers happy. Stay up to date with the latest news and offers from Constant Status. Copyright @ 2015 Constant Status, Inc.